Last Friday was Ava's 5th birthday. 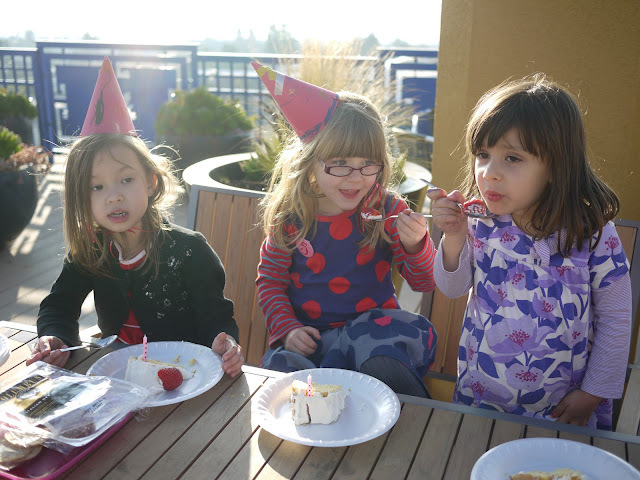 Ava had been planning her 5th birthday party pretty much as soon as her 4th birthday party was over. 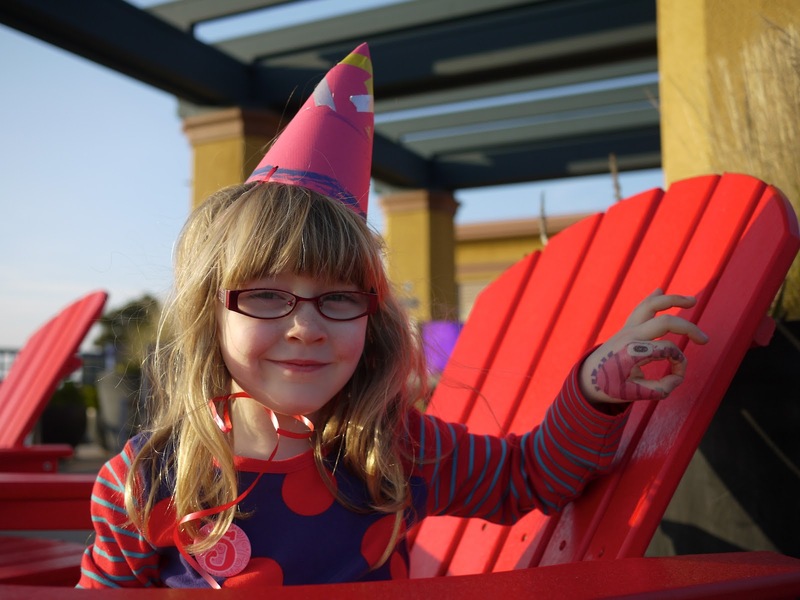 She had such great plans: bouncy castle, pony rides, face painting... most of which were never going to come into fruition! But of course, our move to America made all of these party plans a little tricky. I was a little worried that Ava might not have made many friends by the time her 5th birthday came around so I was looking into ideas for a small family weekend trip. 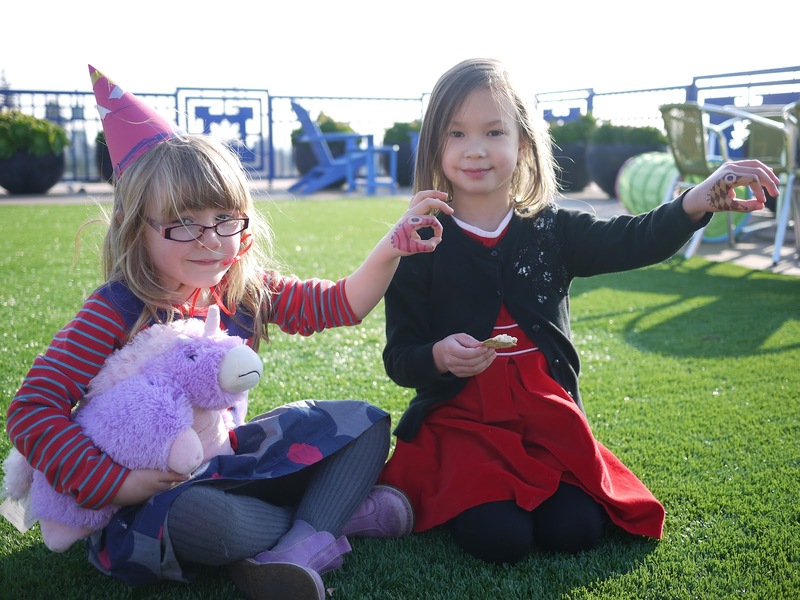 It turns out though that Ava HAS made a few good friends at preschool and she was very eager to celebrate her birthday with them. So Friday afternoon, after preschool, our roof top garden became party central for Ava and a handful of friends from preschool. I felt a little disorganised for this little party. Normally I would have made invitations that would have been posted out weeks in advance. Normally I would have spent ages working on a cake design, party games and party bags. This year there were no paper invitations. There was no pinata. No face painting. There wasn't even any baking on my behalf, other than the birthday cake. 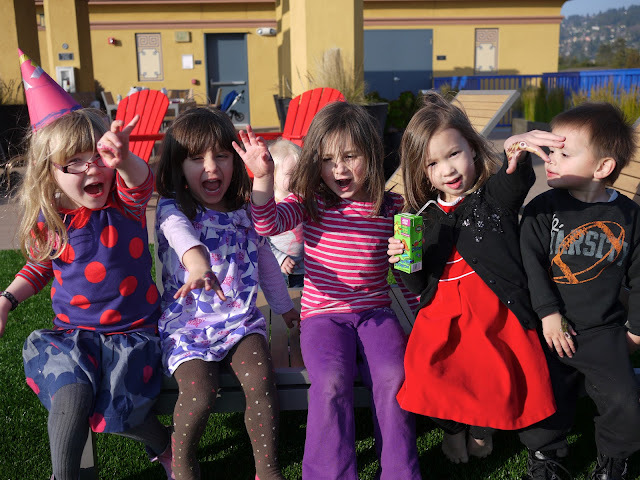 Instead it was just a few kids running around on our roof top garden making their own fun. 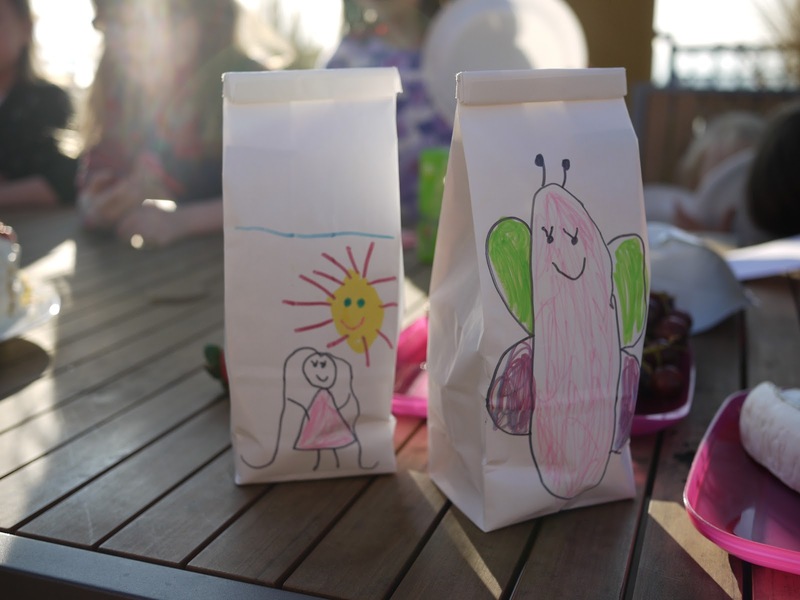 There were party bags, of course. Ava decorated these herself with drawings of butterflies and girls with long hair (her favourite things to draw at the moment). 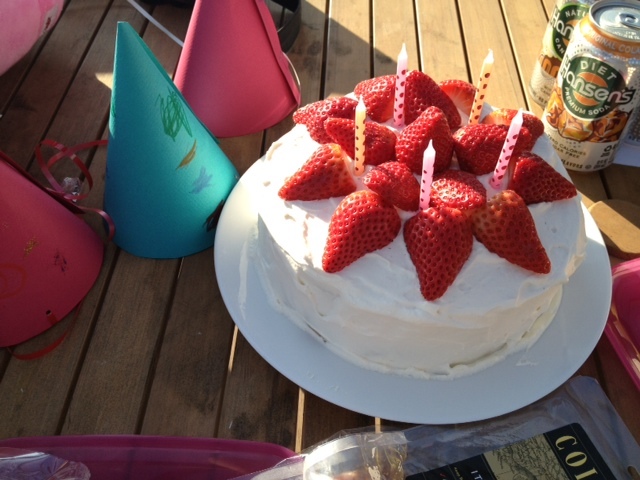 And there was a birthday cake. This year Ava's birthday cake request was simple. She wanted a round cake covered in whipped cream and strawberries. Easy! Much easier than the pinata cake she had for her 3rd birthday or the Hello Kitty cake she had last year. I felt that the kids needed a few activities for the party so I made up some plain party hats for them to decorate with markers, glitter, pipe cleaners and wash tape. Click here for the template. 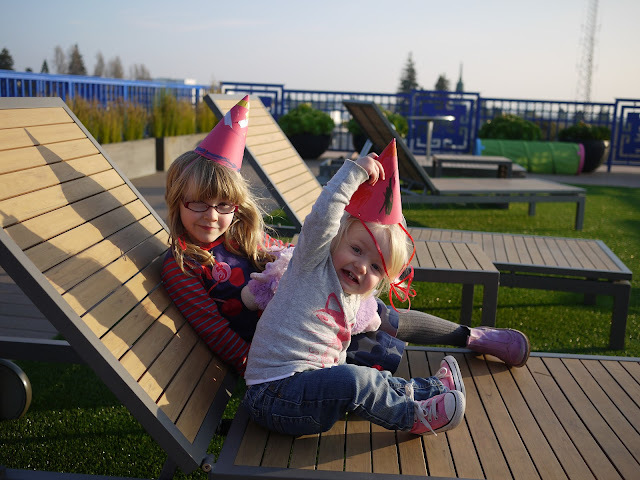 It was quite windy up on the roof so the party hats didn't really stay on all that well. Although strangely, Ava managed to keep hers on the whole time! We did manage to get all the kids (other than Lola) wearing their hats for Happy Birthday and the cake cutting but that was about it. Lola desperately wanted to wear a party hat like the big kids but freaked out every time I tried to tie it on! This was the closest that Lola came to wearing a party hat! I had some of the Monster Hands tattoos left over from Ava's 4th birthday party so we used these on the kids. These worked out much better this time; partly because the kids were older and more willing to sit still and partly because their hands were just that little bigger and the tattoos fit better. That said, trying to get a photo of all the kids showing their Monster Hands at the same time was impossible as you can see below! 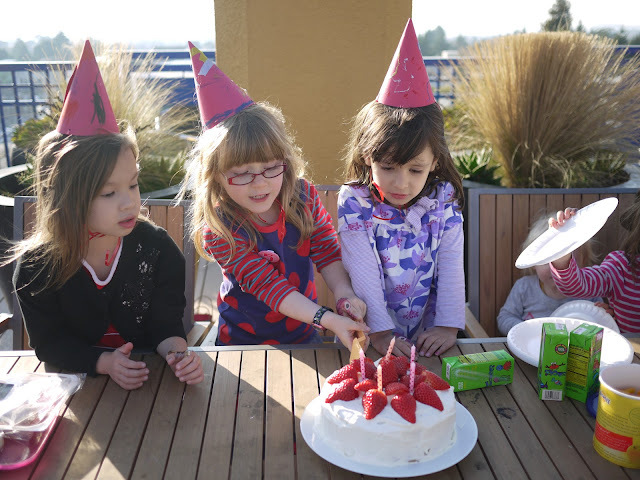 All in all, Ava had a lovely birthday party and can't wait to have her friends over again.